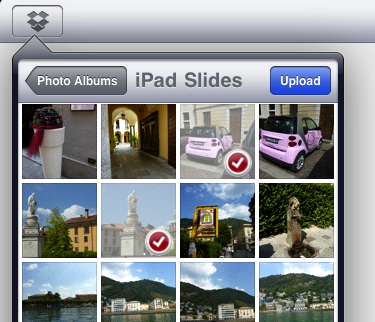 DropBox cloud app for iPad now supports multi file uploads! The navigation buttons across the bottom of the Dropbox app have returned and you can now upload multiple files at a time (pictures and video supported). If you choose ‘Upload’, drill down to the location on your iPad to your images or video you wish to upload to the Dropbox Cloud. Tap as many as you want, then hit the Upload button. Sadly, what isn’t in this DropBox app update is the ability to create new folders which would be handy to keep the uploads in relative folders. 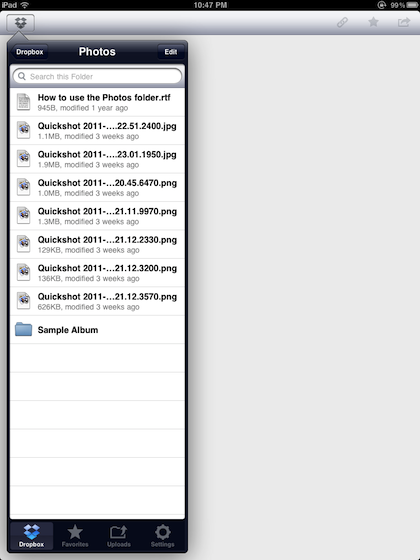 As well, no ability to move the files (both supported in GoodReader for iPad). A less documented ‘feature’ is you can now ‘Open in’ email attachments to DropBox. When you have a document and choose to ‘Open in’, DropBox is listed which moves the document to your DropBox upload area within the DropBox app. 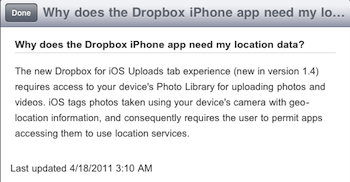 DropBox joins the list of apps that require that you turn on Location Services in order to upload files. It will be interesting to see if this turns out to be a companies using locations for privacy or for iAds data.